This retired couple wanted to recreate a master bathroom reminiscent of the glamorous—and generous—spaces they had enjoyed during their many years living in Italy. Inspired by a love for marble and neutral tones, the clients were more interested in ambiance than having every possible amenity. But they did have one special request: a bathtub built for two. The tub would at once become a centerpiece and challenge of the gracious bathroom. The clients wanted the two-person tub to take on double duty as a shower as well. This required careful specifications in every design detail—from the flat bottom and nonskid surface to fixture choice and placement. The shower controls, for instance, mounted slightly higher on the wall won’t disturb a bather. Likewise, the tub filler, flush against the center wall, won’t get in the way when showering. 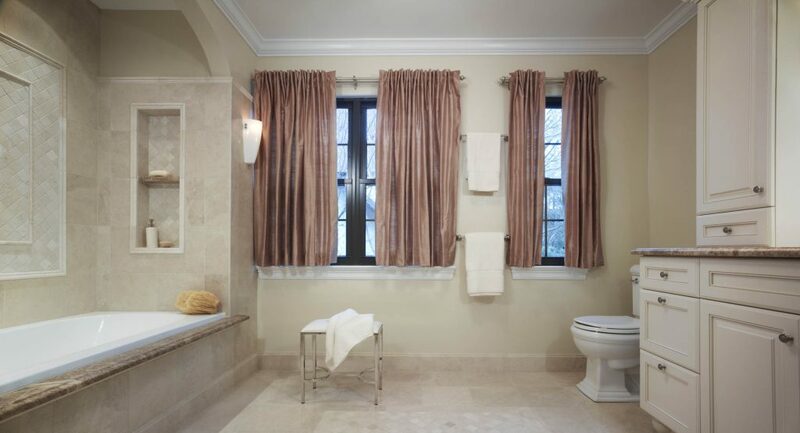 Picking up on cues from the colonial house, the tub nestles into a comfortable nook with a graceful arch above. Similar classic but clean lines were used in the hutch, custom-made to look more like a piece of built-in furniture than a stand-alone vanity. Brushed nickel fixtures coordinate throughout. As a contemporary counterpoint, modern light fixtures—a pair of sconces and a striking glass ceiling fixture—punctuate the soft, fluid design. In keeping with the clients’ desire, marble became the material of choice. Two neutral tones envelop nearly every surface. Twelve-inch square tiles of honed arrowroot marble cover the shower walls and floor, with matching two-by-two-inch mosaic inlays. 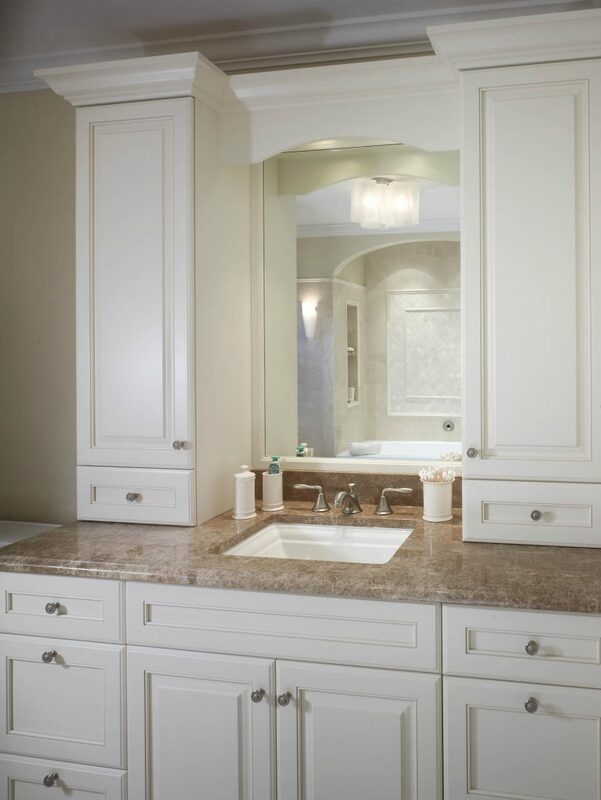 A coordinating marble creates a darker contrast on the counter, tub ledge, niche shelf, and bathroom door threshold. Even the trim and moldings are marble, including the frame around the inlay, the tile cap in the shower, and the baseboard. 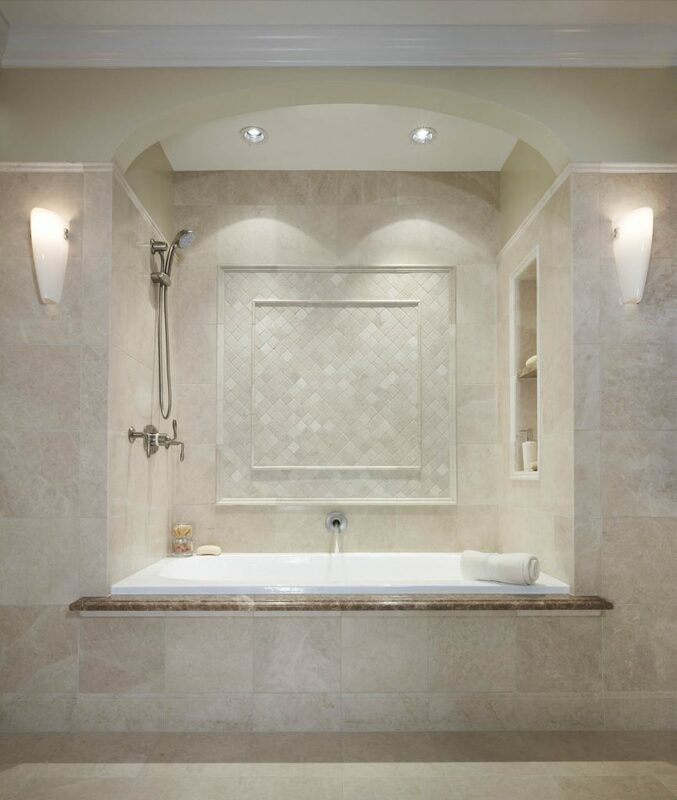 The owners helped choose every slab and tile for its specific organic characteristics. Success was achieved across all fronts—from the bathtub for two, the neutral tones and contemporary lighting for ambiance, and the marble marvel for all.